Last week featured snowy owls and reports continued coming in this week as well. However, the overwhelming highlight this week was the incredible mass migration of snow geese. This annual late-autumn, early-winter event generally coincides with the first serious winter weather in the northern reaches of the watershed. 12/13 – Kingston, HRM 92: Today was that special winter day when the sky seemed filled with shimmering flocks of waves. More than 3,500 snow geese and 800 Canada geese passed over the Forsyth Nature Center in Kingston this afternoon with most of those birds observed in a window between 2:30 p.m. and dusk. 12/9 – Sandy Hook, NJ: I wanted to see if I could land my first-ever striped bass in a snowstorm. I arrived at a deserted Sandy Hook beach just before sundown with two-inches of snow on the ground and more coming down hard. A stiff north wind made the snowflakes feel like little needles on my face. The surf was nicely rough but clear. I saw a small swirl in a deep hole between two sandbars, then another. Then a hit and miss on my fly rod. Then more swirls and I realized I was in the middle of a sea herring blitz. I quickly switched to my spinning rod, tied on a Sabiki rig (no easy feat in the wind) and soon had a half-dozen Atlantic herring (Clupea harengus) on the beach, all of which would soon be marinating in brine. I did manage to catch and release two striped bass in the snowstorm: a 14-incher that grabbed a Sabiki hook and an 18-incher that thumped a bucktail just as I lifted it for another cast. 12/10 – Wappinger Falls, HRM 67: I watched a flock of 25 Canada geese fly over this morning and at the tail end of the formation was a single snow goose. 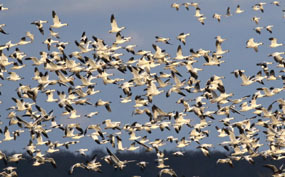 12/11– Albany County: Tom Williams heard at least three flocks of snow geese flying over in early evening. Tom’s observation would be echoed by several more Hudson-Mohawk Bird Club birders including Robert Pastel, Zach Schwartz-Weinstein, and Jeff Nadler. This evening would be the first significant snow goose migration of the season. 12/11 – New Baltimore, HRM 131.5: After hearing of many snow goose reports from the Hudson-Mohawk Bird Club, from Albany to Saratoga, I went outside at 9:00 p.m. and heard a large flock of snow geese going over. 12/11 – Millbrook, HRM 82: Sometimes the elements of an idyllic setting come together slowly. We were enjoying the glow of last light on the snow-covered stubbled cornfields. The reds turned to pink as the light fell. Out in the middle of one field, a quarter mile away, we could make out three coyotes, tiny black figures, walking slowly in single file across the rise of land. Then we heard the geese. Not Canada geese, different voices. We stood still looking up in the increasing chilly air as at least a dozen snow geese flew low overhead. Unbeknownst to us, today would be a major day of migration for snow geese down the Hudson River flyway. 12/12 – Rensselaer-Columbia counties, HRM142-129: It was interesting to hear the changeable sounds of snow underfoot across three days. Two days ago we had newly fallen snow and it was dry and fluffy. I call it “Utah Snow” and it makes no sound under my boots since this type of snow absorbs sound waves. Yesterday, when the temperature of the snow was colder than 14 degrees Fahrenheit the snow beneath my feet was not melted by the pressure of my boots. Instead, my boots crushed the ice crystals making a squeaking sound that I call ”Cornstarch Snow,” which is what Foley artists [creating sounds for film] use to make the sound effect of walking in snow. Today, with the air temperature much colder, freezing rain had hardened the snow on the trails. My footsteps were a careful shuffle that broke through the layer of snow causing a loud crunch. I call this “Times Square Snow,” raucous and harsh. 12/12 – Yonkers, HRM 18: We went out to haul our net in cool, drizzly weather in early afternoon at the Center for the Urban River at Beczak. We were struck by the volume of fallen leaves in the water that made seining much heavier than normal. Across six hauls we landed 15 fish, dominated by young-of-the year (YOY). Among them were YOY Atlantic silverside (50-70 mm) and Atlantic menhaden (45-70 mm).Two year classes of striped bass were also present, YOY (75 mm) and yearlings (120-160 mm). The river was 44 degrees Fahrenheit and the salinity was 10.0 ppt. 12/13 – Ulster Park, HRM 87: Just as the sun was setting today, a flock of 200 snow geese flew over our home. 12/13 – Croton Bay, HRM 34-33: The falling tide was half-way out being pushing seaward by strong northwest winds gusting to 40 miles-per-hour. Between the whitecaps and swells we could make out discreet rafts of waterfowl, most with 25-50 birds, including bufflehead, common goldeneye, ruddy ducks, scaup (possibly lesser scaup), as well as 100 canvasbacks (both hens and drakes). 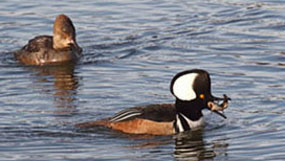 The canvasbacks were likely some of the estimated 200 counted here a week ago by Larry Trachtenberg. 12/14 – Saratoga County, HRM 182: We were out early on Saratoga Lake for the morning part of the Saratoga Christmas Bird Count. Snow flurries gave way to clearing and plentiful sun by late morning. We counted 40 species including Canada geese (1490), snow geese (2), mallard (429), American black duck (41), common merganser (262), red-breasted merganser (5), hooded merganser (2), common goldeneye (251), mixed greater and lesser scaup (150), redhead duck (2), bufflehead (57), and common loon (2). Raptors sighted included bald eagles (2) and one peregrine falcon. 12/14 – Rensselaer County, HRM 162: Several thousand snow geese passed over Tomhannock Reservoir late this afternoon. There was also an estimated couple thousand common mergansers and a few bald eagles. 12/14 – Albany County, HRM 146: An enormous flock of snow geese – at least 400 birds – flew over my home in Meadowdale today. In late afternoon, another similar-sized flock passed over the Helderberg Escarpment. 12/15 – Hudson Valley: In a theme of looking for small favors on these frigid days, we've added one minute to the time of sunset over the last week. 12/15 – Cohoes, HRM 153: This morning, Tristan Lowery and Bernice Gawron spotted a snowy owl flying over gate A6 at the Albany International Airport. 12/15 – Esopus Meadows, HRM 87: I watched a huge flock of snow geese passing over, perfectly alighted by the sun. Right in the middle of the flock was a single “blue goose,” a snow goose color-morph with a dark body and white head. I had never seen one before. 12/15 – Norrie Point, HRM 85: We spotted an adult bald eagle this afternoon from across the cove at the Norrie Point Environmental Education Center feeding on something just above the tide line. Shortly, a second adult eagle arrived. Judging by the fact that there was no contention, we could assume it was a mated pair. We watched this through binoculars but it was difficult to see what they were feeding on. When the two eagles flew off, I sneaked around the shoreline to discover the identity of the meal. All that was left was the large head of a channel catfish. Wednesday, January 10, 2018 from 12:00 noon - 1:00 p.m.
2018 Saratoga READS series; no registration required. Saturday, February 24 - 1:00 p.m. The Hudson River Almanac is compiled and edited by Tom Lake and emailed weekly by DEC's Hudson River Estuary Program. Share your observations by e-mailing them to trlake7@aol.com. To subscribe to the Almanac (or to unsubscribe), use the links on DEC's Hudson River Almanac or DEC Delivers web pages. For real-time information on Hudson River tides, weather and water conditions from twelve monitoring stations, visit the Hudson River Environmental Conditions Observing System website. 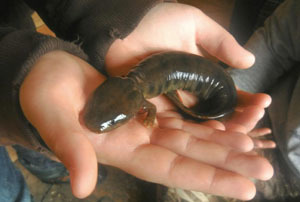 Information about the Hudson River Estuary Program is available on DEC's website at http://www.dec.ny.gov/lands/4920.html . Smartphone app available for New York outdoor enthusiasts! DEC, in partnership with ParksByNature Network®, is proud to announce the launch of the New York Fishing, Hunting & Wildlife App for iPhone and Android. This FREE, cutting-edge mobile app gives both novice and seasoned outdoorsmen and women essential information in the palm of their hands. Powered by Pocket Ranger® technology, this official app for DEC will provide up-to-date information on fishing, hunting and wildlife watching and serve as an interactive outdoor app using today's leading mobile devices. Using the app's advanced GPS features, users will be able identify and locate New York's many hunting, fishing and wildlife watching sites. They will also gain immediate access to species profiles, rules and regulations, and important permits and licensing details. Governor Cuomo's NY Open for Fishing and Hunting Initiative is an effort to improve recreational opportunities for sportsmen and women and to boost tourism activities throughout the state. This initiative includes streamlining fishing and hunting licenses, reducing license fees, improving access for fishing and increasing hunting opportunities in New York State. In support of this initiative, this year's budget includes $6 million in NY Works funding to support creating 50 new land and water access projects to connect hunters, anglers, bird watchers and others who enjoy the outdoors to more than 380,000 acres of existing state and easement lands that have gone largely untapped until now. These 50 new access projects include building new boat launches, installing new hunting blinds and building new trails and parking areas. In addition, the 2014-15 budget includes $4 million to repair the state's fish hatcheries; and renews and allows expanded use of crossbows for hunting in New York State. This year's budget also reduces short-term fishing licenses fees; increases the number of authorized statewide free fishing days to eight from two; authorizes DEC to offer 10 days of promotional prices for hunting, fishing and trapping licenses; and authorizes free Adventure Plates for new lifetime license holders, discounted Adventure Plates for existing lifetime license holders and regular fee Adventure Plates for annual license holders. NOW AVAILABLE: Receive DEC's Twitter feed via email.